CHICAGO — The saving grace for the 2018-19 Blackhawks is supposed to be Corey Crawford. Chicago optimists point to how the Blackhawks were still a playoff contender before Crawford was sidelined with a mysterious head injury, and believe his return to health can catapult the team back to the postseason. Unfortunately, any feel-good narrative should have been deflated Friday when Crawford met the media before the Blackhawks’ annual fan convention. 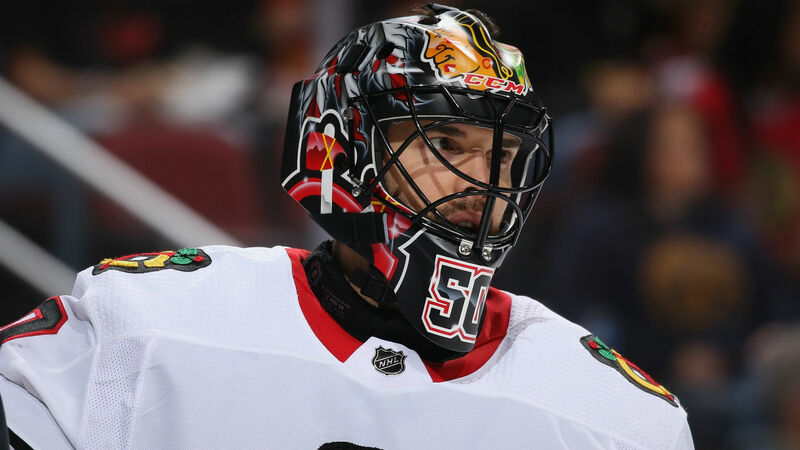 Unlike general manager Stan Bowman’s and coach Joel Quenneville’s positivity, Crawford only said it would be “very possible” for him to feel 100 percent by training camp and stopped far short of saying he’d be ready for the Oct. 4 opener. Regardless of Crawford’s status for September and October, the fact the Blackhawks were exposed as being so dependent on their goalie last season is troubling for many reasons. One of which is how they’ll have to handle his workload if and when he does play this season. Since becoming the unquestioned starter during the 2010-11 season, Crawford hasn’t been the NHL’s most durable goalie, never playing more than 57 games in a campaign. Even if he does come back sometime this season, it’s not like the Blackhawks will be able to ride him as much as they’d like to save a roster that, barring a move before camp, still looks too weak to compete with the NHL elite. That means former Hurricanes goalie Cam Ward will have to step in for at least 35 games. And though the Blackhawks are quick to point out his Stanley Cup and Conn Smythe resume, those days are far in the past for Ward. Last season, Ward had a 23-14-4 record that masked a .906 save percentage, and he only regained the No. 1 job after former Chicago backup Scott Darling flopped badly. In an absolute best-case scenario, Ward isn’t Crawford’s partner but his true backup who plays only when the two-time Stanley Cup winner needs a break. In the worst case, it’s Ward, Anton Forsberg or maybe prospect Collin Delia trying to keep Chicago competitive in the lethal Central Division. The Blackhawks also know what they have to do to support Crawford, whose season ended in December with a 16-9-2 record, 2.27 goals-against average and .929 save percentage. To keep Crawford on the ice as much as possible and ready for the business end of the season, they’ll have to manage his health when and if he does return from the ailment they still haven’t disclosed. Waite didn’t want to say whether there’d be a concern about Crawford’s health if or when he does play again. Among the many issues facing Crawford, the idea he hasn’t skated rubs some the wrong way. Other than an ill-fated skate Feb. 12 in Arizona, Crawford hasn’t been on the ice since his last start Dec. 23 in New Jersey. Crawford made it clear he didn’t want to discuss what he’s doing to stay in shape. He pointed to how there are still six weeks until training camp, and that once Crawford is 100 percent healthy, it wouldn’t take him that long to get ready. By the time Crawford is ready to go, Chicago could be well past exhibition games. It could be Nov. 1, Nov. 15, Dec. 1 or even later. And at that point, Crawford would need to work himself into game shape during the heat of a pivotal season for Chicago’s future. There is something Crawford is sure of: He’ll be able to return to the form that had him in contention for his first Vezina Trophy. “I don’t doubt that at all,” Crawford said.